Increase your visibility in the community – As a new member you will be listed on our website, on Facebook and have the opportunity to be highlighted on the Chamber’s blog. You also can grow your business by advertising with the Chamber and sponsoring events. The Chamber will also promote your Grand Opening/Ribbon Cutting and assist with any public relations. Networking Opportunities – The Chamber offers members many ways to network including mixers, lunch and learn seminars, Grand Opening/Ribbon Cutting ceremonies, and other special events. Advocacy – The Chamber represents the local business community at City Hall and other venues, giving a voice to the membership’s ideas and needs. Professional Development – Each month, the Chamber has opportunities for members to attend training sessions, workshops, and seminars that will help your business succeed, such as sales, marketing, social media, networking and more. Cost-effective Advertising – With a Chamber membership you receive discounted advertising. You also can list any news, promotions or events though our website and database system. Member Only Services – You can receive member-to-member discounts and discounted Certificates of Origin. The Chamber also provides assistance with Ribbon Cuttings including assistance with public relations, providing ribbon and ceremonial scissors. 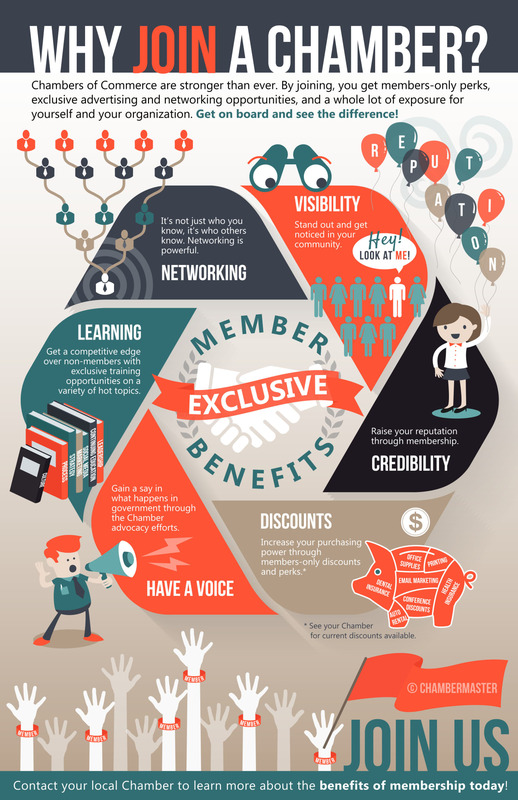 Access to the Chamber’s membership – As a member, you would have access to the database which has more than 600 businesses – This is a great way to reach out to other members, network and make referrals. Credibility – Many members of the community consider a Chamber of Commerce membership to be a sign of a reputable, solid business. When you join the Chamber, you will receive a Chamber of Commerce decal to display in your business’ window, so other businesses know you are a member. Access to community leaders and elected officials – The Chamber meets regularly with city leaders regarding business issues. Every year, the Chamber travels to Tallahassee for the legislative session to lobby and advocate for the business community, as well as a yearly trip to Washington D.C.
Small business advocacy – The Chamber focuses on the needs of small businesses, offering specialized training for small business owners and the opportunity to attend the Government & Legislative Affairs committee each month.